In the two and a half years of Polyorchard’s existence the band has blazed a trail across the territories of modern music performing their own compositions (spontaneous or otherwise), collaborating with Merzbow, paying tribute to Sun Ra on his 100th arrival day, and performing Terry Riley’s In C on the 50th anniversary of its premier. Polyorchard is a flexible fighting unit morphing to fit the battle of the day in formations ranging from small scale trios to the sprawling madness of a double dectet. Polyorchard has shared bills with artists as diverse as Duane Pitre, thingNY, Ken Vandermark/Nate Wooley duo, Michael Pisaro & Greg Stuart, Jon Mueller, and Half Japanese. Plans for 2015 include collaborating with Olivia Block, exploring the late work of John Coltrane, and further work with balloons. Over one beautiful weekend in late September 2014 Polyorchard laid down it’s first studio recordings. Color Theory in Black and White represents two aspects of the trio personality. The first trio on the album is a string trio of Chris Eubank on cello, Dan Ruccia on viola, and David Menestres on bass. The back half of the album is occupied by the trio of Jeb Bishop on trombone, Laurent Estoppey on saxophones, and David Menestres on bass. Color Theory in Black and White was recorded in glorious binaural sound by Dan Lilley and mastered by Andrew Weathers. Listen at maximum volume in front of your best speakers or get lost deep in the sound of your favorite headphones. The revolving, motley assortment of classical, jazz and rock musicians have played practically every kind of music in every possible configuration in almost every Triangle venue, emerging as a vital and wonderfully vexing force of the area’s sonic fringes. But at last, and mere weeks before founder and sole constant David Menestres leaves North Carolina for New Mexico, Polyorchard have issued their first recording, Color Theory in Black and White. An impressive entry point into group improvisation, it arrives better now than never. Polyorchard’s studio debut appears to pit strings against brass. On its “black,” first side, the trio of cellist Chris Eubank, violist Dan Ruccia and bassist Menestres deliver four tracks. (Ruccia is an occasional INDY contributor.) The second, “white” side contains six cuts with Jeb Bishop on trombone and Laurent Estoppey on saxophone, Menestres binding the two together. But this oppositional setup is a matter of presentation, not competition. Still, it’s hard not to choose a team. Within passages that flow from microscopic sounds to lyrical swells and anxious moments that suggest Hitchcock soundtracks, the black trio offers plenty of classical toeholds. “Black 1,” the first and longest track on the album, shows Polyorchard’s penchant for establishing a motif but moving along before it goes stale. The action opens with a spidery crawl and builds full phrases from small scuttles. It develops until the sounds suggest the musicians working together to renovate a house, the audience left to listen from the basement. “Black 2” explores the percussive possibilities of the bodies and strings of the instruments. It’s simultaneously destructive and constructive, as though the group is playing while being bashed about by a windstorm. The horns of the white trio offer fewer jazz echoes but instead breathe and burble with molten intensity. Their output feels more disparate and airborne, with the insect sounds of strings giving way to the honks and chirps of the birdlike horns. “White 1” echoes “Black 2” in its opening, fooling the ear into wondering if this is organized music at all, and not a field recording from some remote rain forest. The tracks take time in developing from a chatter of clipped, skittering sounds into declarative choruses of sustained notes and elaborated phrases. “White 4″doesn’t begin to cohere until around the six-minute mark, when it finds a bright melody and some momentum, suggesting something Stravinsky might have shoehorned into The Rite of Spring. 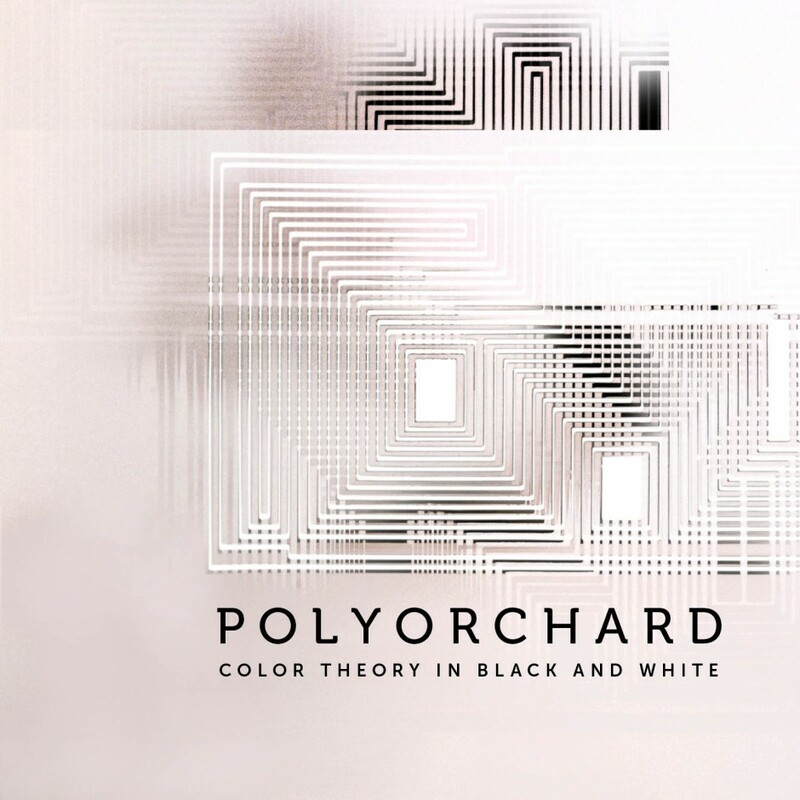 With Color Theory in Black and White, Polyorchard shows how Albers’ definition of music is limited. Group improvisation requires a sustained attention not only to the present moment but to the music that preceded it as well as the many possible directions it could take. While some improvisers vie to get out in front of each other to show off their chops, the elements of Polyorchard get behind each other. This holistic surface never wavers, a byproduct of all those gigs during the last three years. The musicians are listeners first, players second.